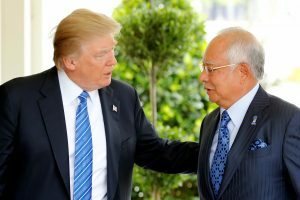 WASHINGTON — President Donald Trump praised Malaysian Prime Minister Najib Razak for his country’s financial investments in U.S. companies during a meeting Tuesday at the White House and thanked him for helping to fight Islamic State militants. Left unsaid by either leader: anything about the massive corruption scandal swirling around Najib’s multibillion-dollar state fund. Malaysia’s government has said it found no criminal wrongdoing at the fund, called 1MDB and founded by Najib. But it has been at the center of investigations in the U.S. and several countries amid allegations of a global embezzlement and money-laundering scheme. The U.S. Justice Department says people close to Najib stole billions of dollars, and the federal government is working to seize $1.7 billion it says was taken from the fund to buy assets in the U.S.
White House press secretary Sarah Huckabee Sanders said later Tuesday that she was “not aware” of the corruption accusation coming up during Trump’s conversations with Najib. At their meeting, Trump and Najib instead focused on areas of agreement, such as economic development and counterterrorism measures when they spoke during a public appearance in the Cabinet room of the White House. “Mr. Prime Minister, it’s a great honor to have you in the United States and in the White House,” Trump said. Flanked by Secretary of State Rex Tillerson and Vice President Mike Pence, the president crossed his arms and listened raptly as Najib described Malaysia’s purchase of billions of dollars’ worth of aircraft from Chicago-based Boeing. Trump said the deal is worth $10 billion to $20 billion. On fighting ISIS, Najib said his country would do its part to “keep our part of the world safe.” And he encouraged Trump to continue building partnerships in the region. “The key is to support moderate and progressive Muslim regimes and governments around the world because that is the true face of Islam,” Najib said. Najib has resisted calls to resign, has clamped down on critics and continues to enjoy the unwavering support of most ruling-party members, but his real test will come in general elections due by mid-2018. Senior opposition lawmaker Lim Kit Siang said many Malaysians viewed Najib’s White House visit as a “national humiliation and shame” as he is tainted by the 1MDB financial saga. Analysts said Najib hoped to dispel the corruption scandal and secure political legitimacy with the White House visit. “He can tell Malaysians that the 1MDB is a non-issue and that the opposition’s message that he is unwelcome by world leaders is not true. He will also try to convey the impression that the U.S. investigation on 1MDB has nothing to do with him,” said James Chin, who heads the Asia Institute in Australia’s University of Tasmania. Najib’s entourage was spotted several times at the Trump International Hotel, down the street from the White House. Trump stepped away from his global real estate, marketing and property management company when he took office, but he has not cut financial ties with it. Sanders said Tuesday that the White House had nothing to do with choosing the accommodations of visiting foreign dignitaries. She said she did not believe Najib was trying to curry favor with Trump by staying at his hotel. Ng reported from Kuala Lumpur. Left: U.S. President Donald Trump welcomes Malaysia's Prime Minister Najib Razak to the White House in Washington, U.S. September 12, 2017. Photo by REUTERS/Jonathan Ernst.